Birth injuries don’t only put infants’ lives in jeopardy, maternal prenatal birth injuries can be just damaging and severe during and after pregnancy. Proper prenatal care and careful monitoring of expectant mothers and the developing fetus gives doctors the opportunity to intervene where necessary to protect both their lives. If the cervix opens or begins to shorten too early, a cervical cerclage is used to stitch the cervix closed so it can hold the weight of the growing baby and prevent late-term miscarriage or premature birth. A glucose screening is a standard prenatal test that allows a doctor to diagnose gestational diabetes. Mothers with high glucose levels can lead to babies being born prematurely with respiratory problems and a higher chance of developing diabetes later in life. Mothers are tested for group B strep in the third trimester of pregnancy. If GBS goes undiagnosed, it can be passed from mother to baby during delivery and lead to breathing trouble, fever, lethargy, or difficulty feeding. More severe complications include meningitis or sepsis. If cervical tissue weakens and the cervix dilates too soon, this can result in premature birth. When properly diagnosed, cervical insufficiency can be managed with progesterone shots or a cervical cerclage to prevent late-term miscarriage or preterm delivery. Fetuses weighing over 9lbs. 15 oz. are considered macrosomic, a condition that puts them at higher risk for health complications like childhood obesity and metabolic syndrome. Mothers carrying a large fetus are at risk for uterine rupture, bleeding after delivery, or the need for a C-section. During pregnancy, mothers may be prescribed medication to treat sickness or infection. During delivery, anesthesia mistakes can be made. If the wrong medication or dosage is administered, it can lead to severe consequences for both mother and baby. Infections can be passed from mother to baby during pregnancy or delivery if a doctor does not diagnose and properly treat problems like a UTI or bacterial vaginosis, making babies susceptible to premature birth, infant meningitis, and oxygen deprivation. 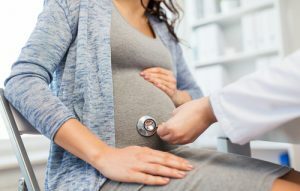 Too little amniotic fluid in the womb means could be the result of premature rupture of membranes, placental abruption, restricted fetal growth, a genetic disorder, or a mother’s chronic high blood pressure. In placenta previa, the placenta attaches to the lower portion of the uterus. The placenta should be at the top of the uterus, allowing room for the fetus underneath. Placenta previa can lead to hemorrhaging for the mother. Placental abruption is when the placenta peels away from the wall of the uterus. This problem can be moderate to severe – in the worst case, the entire placenta detaches. Any instance of placental abruption can lead to severe injuries for mother and baby. A damaged or poorly developed placenta, also known as uteroplacental insufficiency, cannot provide the fetus with the nutrients and oxygen it needs to thrive. If placental insufficiency goes unrecognized, the baby will not develop properly and could be born prematurely, stillborn, or suffer oxygen deprivation at birth. Pregnancy that goes beyond 42 weeks is considered post-term, increasing the chances of a degrading placenta, lack of oxygen, and contaminated amniotic fluid. If the placenta stays healthy, the fetus will continue to grow, which could necessitate a C-section to protect a child from oxygen deprivation in vaginal delivery. Inflammation, infection, bleeding, and cervical insufficiency can all contribute to a premature water break and the likelihood of the infant suffering a birth injury and needing to spend time in the NICU. High blood pressure is the hallmark of preeclampsia, the precursor for eclampsia, a condition that can cause seizures for the mother, endanger her life and the baby’s, and often require premature delivery. If a pregnant woman has had a premature birth in the past or lost a child during gestation, intramuscular or vaginal progesterone can prevent early birth in a high-risk pregnancy and reduce the possibility of birth injuries. The chances of a pregnant woman suffering a stroke during or near time of delivery is increased when the mother has gestational diabetes, high blood pressure, or eclampsia. A rare but fatal condition, vasa previa is when the fetal umbilical cord blood vessels develop improperly and outside of the umbilical cord, making rupture more likely and leaving the fetus vulnerable. If you or your baby suffered prenatal injuries because of poor medical care, contact the Michigan birth injury lawyers at Thurswell Law to fight on your behalf. Receive the financial compensation you deserve for the suffering you and your family have had to endure. Contact us at (248) 354-2222 to schedule your free consultation We do not charge any fees unless you collect.